There is no rational reason why motorised vehicles should be permitted to exceed speed limits on public roads. Putting aside the question of why it’s possible to buy cars for the road that are capable of exceeding the national speed limit by 100%, neither the threat to other people’s lives nor the risk of penalties dissuades motorists from driving within the law. 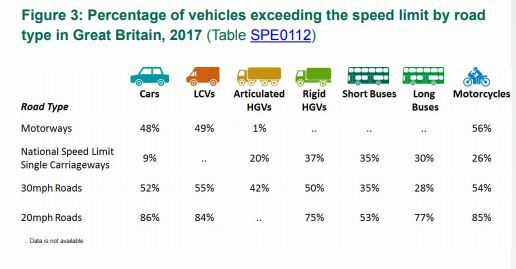 For example, in the 20mph zones intended to safeguard areas where people live and children go to school, 86% per cent of car drivers break the speed limit. The figures above are based on data collected by the Department for Transport’s Automatic Traffic Counters (ATCs) and excludes locations where factors such as junctions, hills, sharp bends or speed cameras might slow drivers. In other words, the statistics provide insights into speeds at which drivers choose to travel when free to do so. The need to control traffic speed by force is as old as cars themselves. Following a period of explosive growth in car ownership in America during which the number of increased from 200,000 motorised vehicles in 1909 to 2.25 million in 1916, politicians, police and judges debated how to control them. As most people had yet to own their own car, the response to mounting carnage was visceral; newspapers labelled killer drivers as ‘remorseless murderers’ and likened the threat they posed to public health to an epidemic disease. 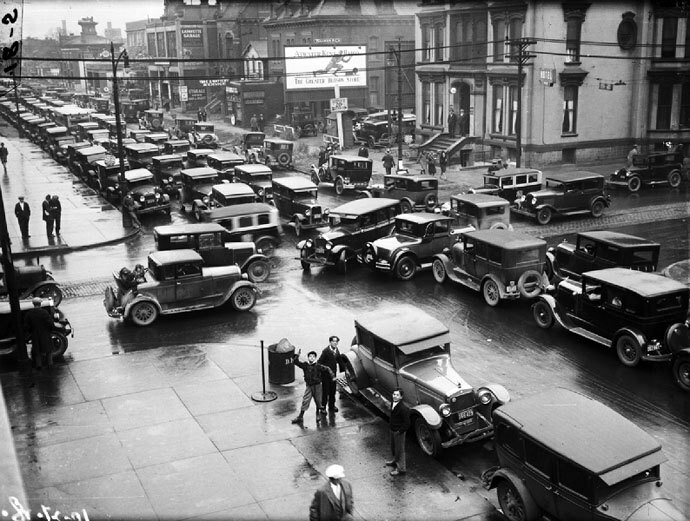 In Detroit – an American city synonymous with car production – angry mobs would drag dangerous drivers out of their cars. When John Harrigan, was convicted of killing a man while drink driving, he was paraded in handcuffs by police in the Safety Parade of 1922. As described by Bill Loomis in his book on Detroit history ‘On This Day’, bells on fire stations, churches, schools and City Hall rang twice a day in memory of the road fatalities. Other towns printed ‘murder maps’ showing the locations of road deaths. So-called safety parades featured wrecked cars occupied by mannequin drivers dressed as Satan and bloody corpses as passengers. New York City and Washington DC held parades featuring 10,000 children dressed as ghosts, each representing a road death that year. The processions were followed by grieving mothers who wore white or gold stars to indicate the loss of their child. Littelfield’s voice was lost amid the clamour for a new motoring age, but in a world that now sees 1.25 million people killed on its roads every single year, calls for speed limiters have returned. Intelligent Speed Assistance (ISA) uses GPS-linked speed limit data to advise drivers of the current speed limit and automatically limit the speed of the vehicle as needed. Such systems do not automatically apply the vehicle’s brakes, but instead limit engine power to prevent the vehicle from accelerating past the current speed limit unless overridden. This type of ISA system is already offered as an option by various manufacturers but calls by the EU for this technology to be fitted as standard is being fought by the car industry as vociferously today as it was in America a century ago. Er – I think you meant dissuade them from breaking the law, or perhaps persuade them to drive within the law. I thought driverless cars would be an improvement because they would not break the law, but it seems they are not going to happen. 20 mph zones as currently implemented are mostly a complete waste of time. What is needed are 20 mph blanket zones, where all roads are 20 mph. Currently, it’s often only a short length of road and often consequently ignored by many motorists. There is of course little or no enforcement. I would like to see covert speed cameras that catch extreme speeders with extreme fines, because they represent an extreme risk to Public safety.